Robotic Mowing Service – J Hubler Inc.
Let’s face it. Life is busy. We know how difficult it can be to keep up with yard work in addition to your schedule. With our robotic mowing service it not only allows for more time spent doing what you love outside of yard work, but it does an incredible job that will have you loving the high-quality “always mowed” look. No more tearing up the yard, skipping cuts due to weather, or using headphones to block out the sound of a noisy mower. The robotic mower is emission free and will mow day and/or night as needed to keep the grass well-maintained. What does our robotic mowing service include? 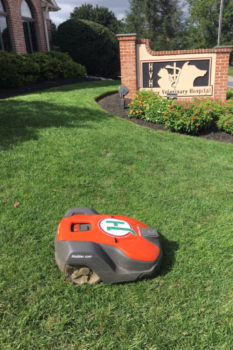 Our robotic mowing service at J. Hubler Landscaping is located in Elizabethtown, PA. Our service extends to Lancaster, Harrisburg, Hershey, Lebanon, York, and beyond. Can the robotic mowers be used on commercial properties? Yes! We are equipped to handle commercial properties. Are the robotic mowers kid-friendly and pet-friendly? Yes! They are equipped with infrared sensors that determine any type of oncoming movement or when it is being touched and will automatically stop and change direction. How does the robotic mower know where to mow? We professionally install a boundary wire around the property that lets the mower know boundaries and areas to avoid. The mower will learn the yard over the course of several weeks. Does it mow in the rain? Yes! The robotic mower is able to mow 24/7, rain or shine, with breaks to charge. What if it gets stolen? The mower is equipped with anti-theft functions that help deter lawn mower lifters. First, there is an alarm that will sound when the mower is lifted. This sends a notification to our team member that the mower is outside of the boundary wire. Second, the mowers are GPS equipped so they are able to be tracked wherever they go. Lastly, if the mower is completely irretrievable we will have the mower blacklisted so that it is unable to be paired with another charging station.